After getting off the floating palace (or shall we say administrative center), I struggled to awake from my Dramamine-induced stupor. 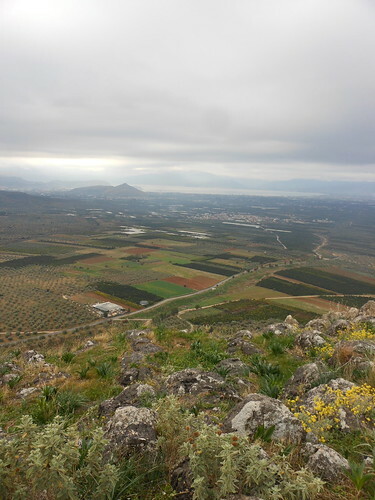 On the way to Nafplion, we visited Lerna, where settlement began in the Neolithic age, some 8,000 years ago. Among endless orange groves, we found the House of Tiles, a mudbrick building, from the mid-3rd millenium BCE. 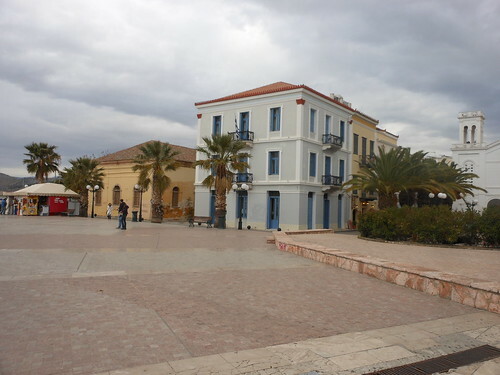 By the time we arrived in Nafplion, our base for the next two nights, I was more awake. Plus, there was laundry service for us! We spent midday at the Center for Hellenic Studies building (above), looking on to Philhellene Square. Then we went to the town's awesome archaeological museum with its prehistoric and Mycenaean collections. I haven't traveled extensively in Greece, but I feel rather certain that no town is as picturesque as Nafplion. 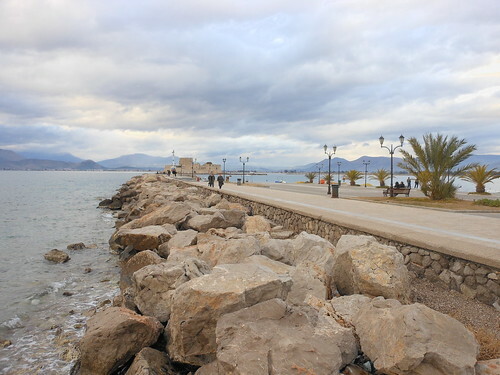 A gorgeous coast, boutiques, and gelaterias all contribute to Nafplion's charm. Strolling along the coast, I was reminded of California's Route 1. I saw some great plants: cacti covering rocky hillsides, wild grasses, pines, shocking flowers. 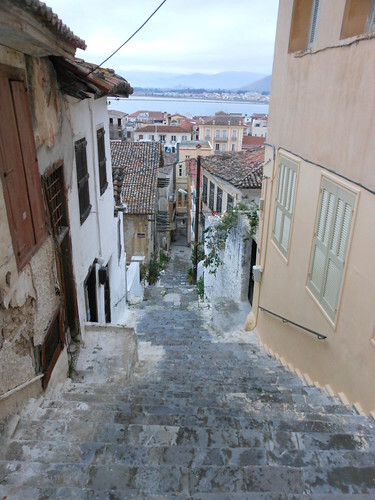 On Sunday morning, I went for a walk and enjoyed hearing some of the church services as I wandered through Nafplion's narrow alleys. After breakfast the group assembled for a day exploring the Mycenaeans, their cyclopean walls, and great megara. 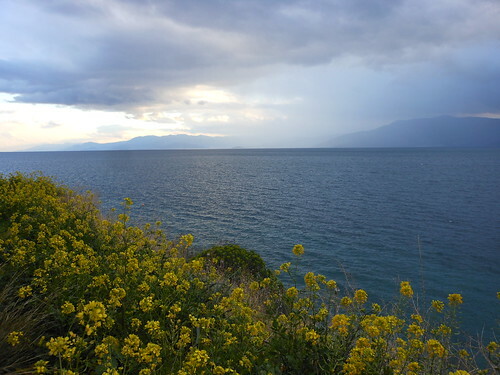 We began at Tiryns, which is close to Nafplion and therefore to the sea. It may have served as a kind of harbor for Mycenae. At the end of the trip in Athens at the National Archaeological Museum, we saw an amazing gold signet ring from Tiryns depicting lion-headed demons approaching a woman or goddess, while crescent moons fill the sky. 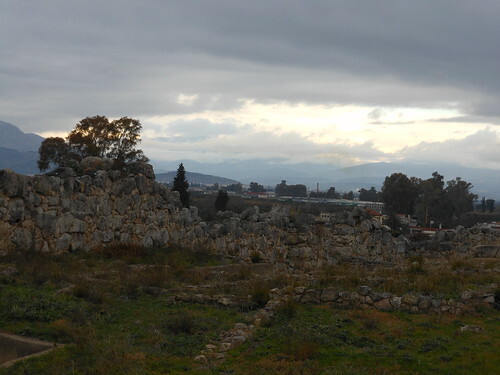 Next we drove further inland and climbed to the acropolis of Midea. From the top I could still see the sea. Though we didn't visit it, Midea's cemetery is called Dendra and it has been the source of some unbelievable archaeological finds, including a suit of Mycenaean armor which is at the Nafplion Archaeological Museum. The National Archaeological Museum in Athens also holds finds from Midea and Dendra, including imported objects like ostrich eggs vessels. 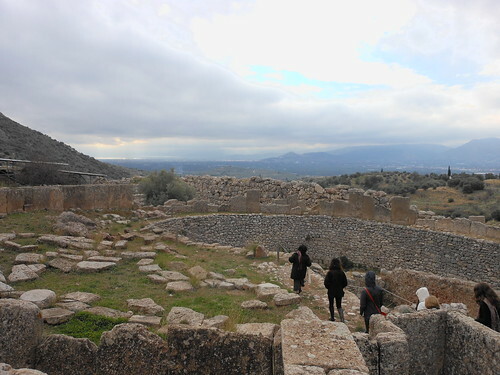 Our third site of the day was the incomparable Mycenae, the center of an empire, located between two foreboding mountains. Ancient roads go from Mycenae to Epidauros, east to the Sardonic Gulf, and west to Corinth. To me, the heart of Mycenae is Grave Circle A. 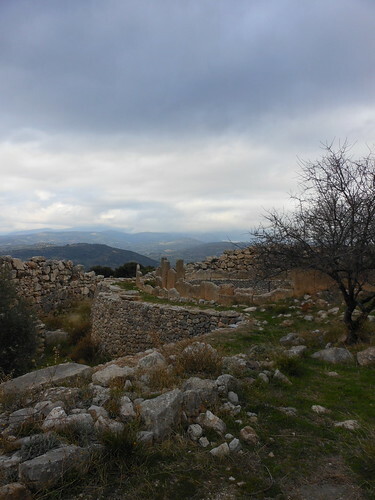 Unusually, the grave circle is inside the fortress walls and its location, adjacent to the fortress cult center, shows its religious significance to the Mycenaeans. The graves date to the 16th century BCE, but the walls enclosing the grave circle date to the 13th century BCE. Again, highlighting the special significance of the graves to the Mycenaeans are the double walls around grave circle. They are made from a special stone that comes only from Perachora, some 60 kilometers away. Here's another look from the cult center to Grave Circle A. 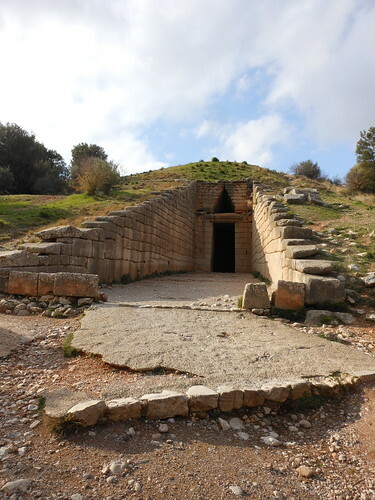 Unfortunately, robbers long ago looted the treasure in Mycenae's tholos tombs. However, these bee-hive-shaped tombs, constructed without mortar, still stand as architectural marvels. I've been to Mycenae twice and neither visit afforded me the opportunity to visit all the tombs. Maybe next time I'll get to see the progression of their building technique from the earliest tomb, named for Aegisthos, to the masterpiece known as the Treasury of Atreus (pictured above). 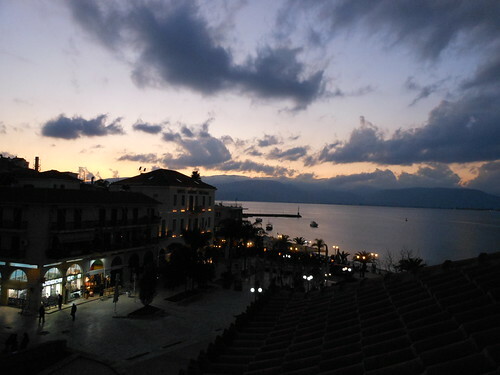 That afternoon, we headed back to Nafplion for some quality cafe-sitting and shopping time. At dinner that night, I was happy to eat my first serving of giant beans in Greece.